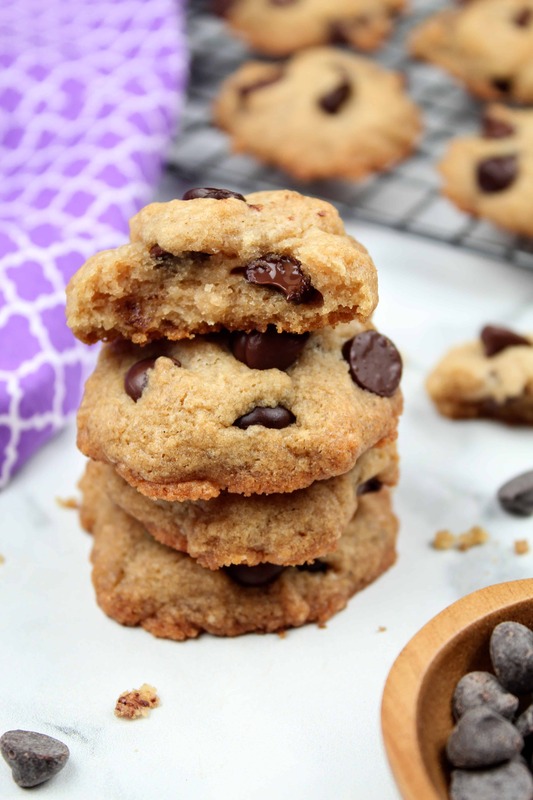 Finally, dairy free chocolate chip cookies that are easy to make! I went the extra mile and also made this recipe both vegan, gluten-free, and top 8 allergen free! I have noticed with my body, that I seem to feel better eating less gluten and animal products. After a few iterations off of the classic Toll House recipe, I think I have finally created the world’s greatest dairy free chocolate chip cookies EVER. I like these a lot better than the original, and have already eaten 8 of them in 6 hours :). Probably going to be up all night with a stomach ache! These cookies are crispy on the bottom and around the edges, and soft and chewy in the center. They have some thickness to them, which gives a satisfying bite. I used Enjoy Life brand chocolate chips in this recipe, but you can easily make your own homemade chocolate chips to save money. When using homemade chocolate chips, the chips will melt as the cookies bake giving the cookie a marbled look. While not as pretty, they are still delicious! And like most of my cookie recipes, these cookies are made in a single bowl. And because the cookies are vegan, you can eat the cookie dough. #WINNING. High moisture content makes a cookie chewy. 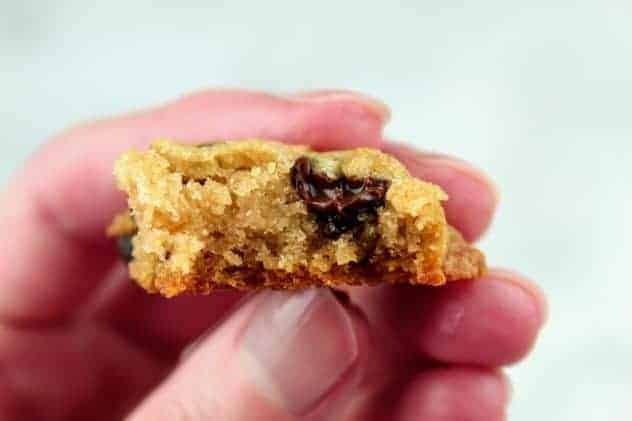 The substitute of eggs with applesauce in this recipe adds a lot of moisture, making the cookies moist and chewy, while still retaining a crisp exterior. Why are my cookies crumbly? Cookies can come out crumbly for a few reasons: too much flour, not enough fat or the wrong fat to coat all of the flour, and/or baking too long. The most often encountered reason is putting in too much flour. This can be avoided by weighing out your flour instead of measuring it out by volume using a measuring cup. However, if you forget to do this and find yourself in a situation where you have too much flour, add in a little more liquid and see if that doesn’t correct the problem. I often bake a test cookie to make sure my dough is right before I bake up the whole batch. 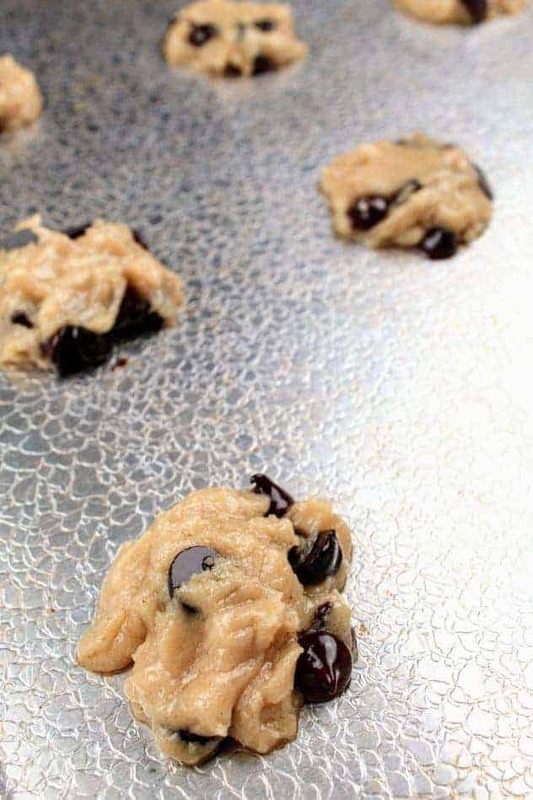 There are several reasons why your chocolate chip cookies might come out too flat: adding too much sugar or butter (which we don’t use here), baking at too low of a temperature, using a warm pan, and/or using room temperature dough. Check out this guide for more details on troubleshooting cookies. 1. Preheat oven to 375F. 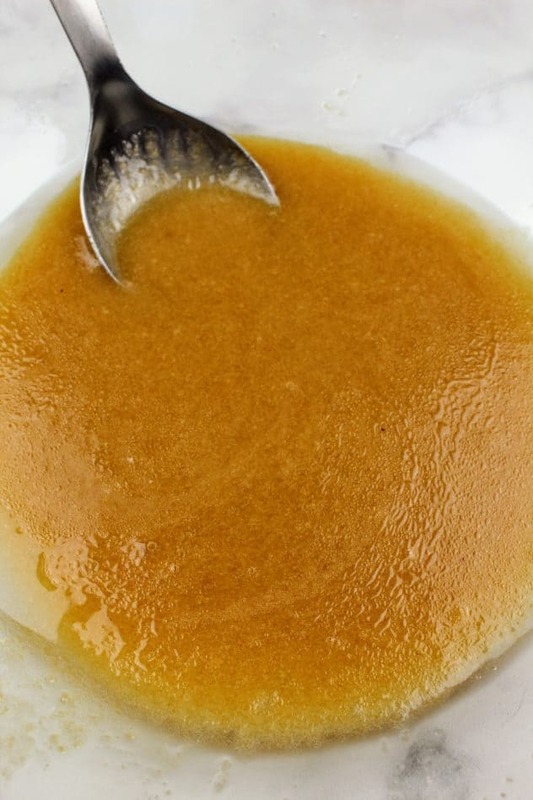 In a large bowl, cream together extra light olive oil, brown sugar, granulated sugar, baking soda, Kosher salt, vanilla extract, and applesauce. Because applesauce contains a lot of water, you will see some separation of the oil from the water. This is ok :). 2. Mix in flour one cup at a time. I used Bob’s Red Mill 1:1 gluten-free flour. After measuring out each cup of flour, I weighed it. Each cup of this flour weighs 5.1 oz, which is substantially heavier than regular all-purpose flour which weighs 4.25 oz. Because measuring out flour volumetrically can lead to too much flour being added and a stiffer cookie, it is always recommended to weigh out your flour. Dough after one cup of flour added. Dough after two cups of flour added. 4. Drop dough by rounded tablespoonfuls onto ungreased baking sheet. 5. Bake for 8-10 minutes or until light golden brown on the edges. 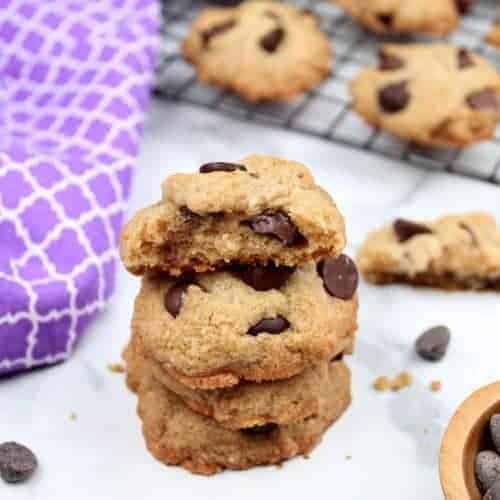 These dairy free chocolate chip cookies are better than the originals, and they are vegan, gluten-free, and top 8 allergen free! Serve with a cold glass of milk of your choice. 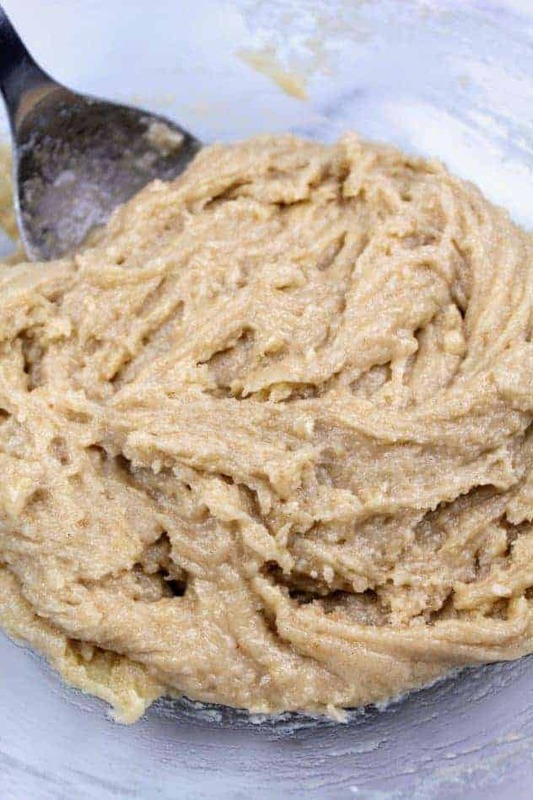 In a large bowl, cream together extra light olive oil, brown sugar, granulated sugar, baking soda, Kosher salt, vanilla extract, and applesauce. Fold in chocolate chips. You can either use store-bought or my homemade chocolate chips. Drop dough by rounded tablespoonfuls onto ungreased baking sheet. Bake for 8-10 minutes or until light golden brown on the edges. 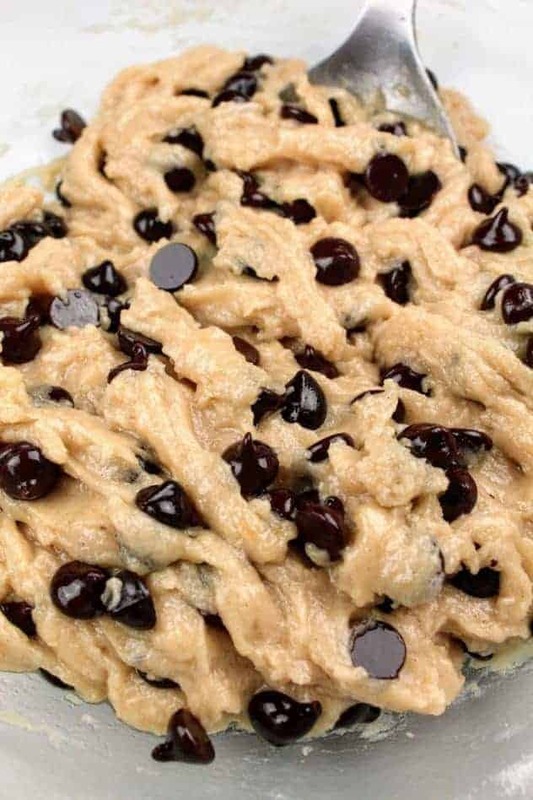 If you are using the homemade chocolate chips, I found it helpful to chill the dough in the refrigerator for 10 minutes before adding the chocolate chips to the dough. I also chilled the dough while baking a batch of cookies. Also, when using the homemade chocolate chips, the cookies are definitely going to spread. So make sure you leave enough room between cookies :). The volume measurement of the homemade chocolate chips is less than the packaged, because they pack in more tightly due to their shape. The amount of calories per cookie is calculated using store-bought chocolate chips. These have been an all time favorite of mine. Will try to make them with your recipe and let you know how it went! It’s great you’ve made a dairy free option. They sound really yummy. We don’t eat dairy free although I am trying to cut out milk so I must attempt baking these biscuits with the kiddies. These cookies look delectable and I am sure it would not be hard to devour the whole plate. 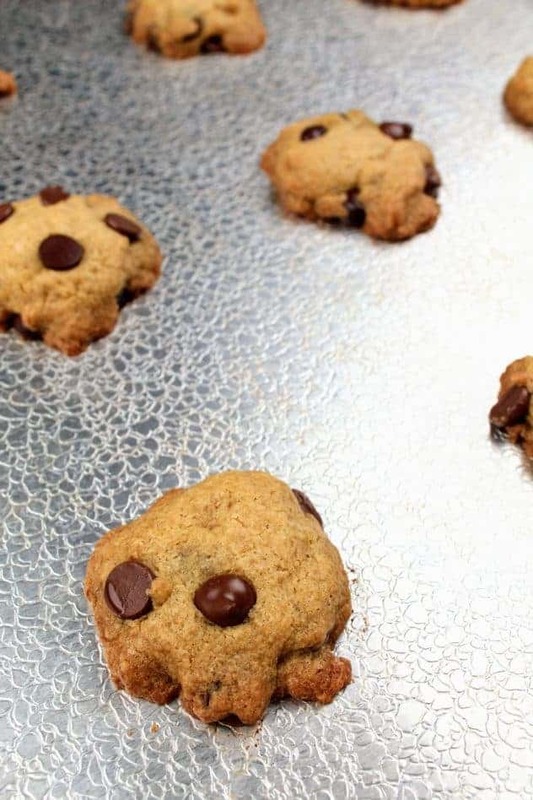 I love chocolate chip cookies and this recipe sounds delicious! I’ll have to try it out. I might sneak a little bit of oatmeal in tho. All sorts of deliciousness!!!! The recipe sounds easy to follow want to try this weekend! Looks delicious! Chocolate chip cookies are my absolute favorites and I’m always looking for treats I can make for friends with allergies! Thank you for sharing this! I have a potluck coming up with friends who have dairy allergies. This will be perfect. You’re welcome! They are going to LOVE these. 🙂 Have a great time at the potluck! The chocolate chip cookies look so yummy! I always love them so crunchy and not chewy because I actually munch them with just a drink. Thanks for the recipe! Dairy-free chocolate chip cookies? That’s brilliant – and perfect for me. I LOVE chocolate – but unfortunately am lactose-challenged. Wasn’t aware of the brand of chocolate chips – or that you can make your own (checked that post out already). Thank you for these recipes! Thanks for taking your time to share this delicious cookies with us. Looks so yummy and tasty. I love cookies, would love to try this on a weekend with my wife. I haven’t had much luck with baking cookies. I will try your recipe and keep your tips in mind. Your chocolate chip cookies look divine! These look super yummy! I would have never thought to substitute apple sauce into the mixture to keep it moist, does it not give the cookies an appley taste? Oh goodness, chocolate chip cookies are totally my weakness! Thank you for this recipe. I guess we know what I’ll be doing tonight. Wow this cookie looks so delicious. My friend doesn’t eat dairy but loves a good cookie and I know she would this recipe.